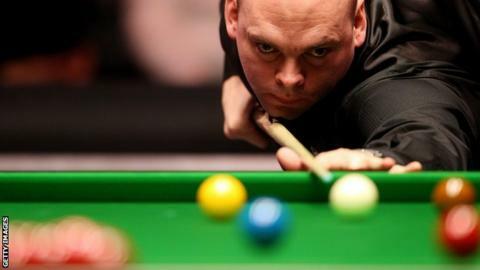 Stuart Bingham beat defending champion Ding Junhui 6-5 to reach the final of the Welsh Open at the Newport Centre. The 2011 Australian Open champion will face Stephen Maguire on Sunday after the Scot defeated world number two Judd Trump 6-4 in the other semi-final. Bingham, 36, was 2-0 and 4-2 ahead before Ding won three successive frames to take a 5-4 advantage. However, Bingham compiled a break of 93 to make it 5-5 before clinching victory with a 108 break in the deciding frame. China's Ding, 25, had moved to within a frame of reaching his second Welsh Open final in a row when Bingham conceded the ninth frame after missing the black off the penultimate red. But world number 10 Bingham fought back to take the last two frames and win a thrilling contest. The other last-four meeting also switched back and forth as 2011 UK Championship winner Trump raced into a 2-0 lead before Maguire replied with the next five frames. Trump refused to back down, however, and a break of 86 moved him to within a frame of Maguire at 5-4. The world number six then held his nerve to to set up a showdown with Bingham which will be decided in the best of 17 frames with £50,000 on offer for the winner.